Hey everyone! I hope this post finds you all doing well and still doing your thing to lead a healthy & active lifestyle. As you may have noticed, I haven't published any blog posts since last Tuesday. The reason why is that I've been busy with work, building my new fitness performance site, getting things in order for my side business as well as traveling back down to my home state of California. 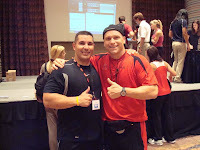 This past weekend was rejuvenating, exhilarating & very energetic as I attended the 2010 Perform Better Functional Training Summit in Long Beach, CA. 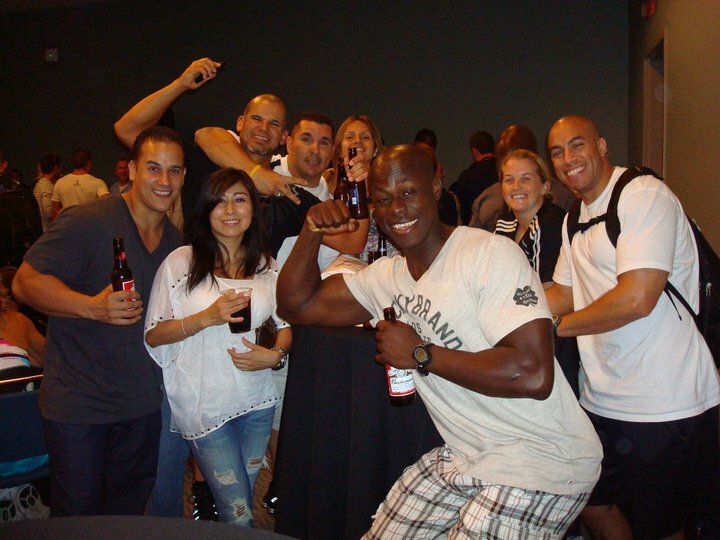 This is a weekend where fitness professionals and coaches have the opportunity to attend lectures and hands-on workshops presented by top elite fitness industry leaders. It's also an opportunity to reconnect with old friends and a chance to meet and network with new ones. I have to say that this year was by far the best Summit that I have attended since '06. Every year, the conference gets bigger (attendance wise) and better. As trainers & coaches, we train & work hard which often times results in the opportunity to 'play hard' thus creating balance in our lives! We had some insane workouts take place - we literally had our asses handed to us on a platter by Alwyn Cosgrove, Robert Dos Remedios, Martin Rooney and my man, good friend and fellow SDSU Aztec brother Todd Durkin. The Perform Better crew was awesome too! They provided exceptional service taking care of equipment orders and meeting the needs of each trainer & coach. A special thanks and 'hello' goes out to Jacob Guajardo & Jennie Rohde (from RI) - both of you ROCK! Looking forward to seeing you both next year, sooner if possible. I also want to say thanks to my buddies & elite trainers whom I had a chance to reconnect with - Mike Rouillard (from my old stompin' grounds of San Diego), Terrence Wilson (from NY), and Sascha Metzger (from Germany). You guys are the best! I look forward to reuniting the 'Fearsome Foursome' again soon! Thanks to my good friend and other SDSU Aztec brother Steve Cotter, whom I had the chance to touch base with after not seeing each other in over 8 years. Thanks to my longtime pals whom I use to work with in San Diego at Frog's Athletic Club (when Frog's was awesome) - Tony Ferrarelli, Michelle Martin and Paul David. I'm very blessed and fortunate to have maintained our friendship all these years. Also, a big thanks to my new friends and elite trainers whom I had the chance to meet this year - my bro Mike Torres (from NY) , Gina Rozo & Kennedy Kombo (from Sac), Troy (from San Diego), Julie Twaddle (from the UK), Steph & Christine (from AZ), Susan Sange (from Napa), Carina Weston & Vickie Lane (both from Pasadena), Sam Caucci (from Parisi Speed School - New Jersey), Troy Fontana (from NV), Karim Khaliki (from San Diego), and my local bros Tim Funkhouser and Luka Hocevar (both from the greater Seattle area - Pac NW) - I look forward to connecting with both of you soon! I also want to thank everyone else whom I may have forgotten. God bless and I look forward to seeing you all again soon!